It's been quite the year for the stock market and the same can be said for natural disasters. Unfortunately, though, the latter is not a good thing, unlike the former, with the S&P 500 up 18.7%. Houston and other parts of Texas were devastated by a lingering hurricane that caused massive flooding in the area. Just weeks later, another hurricane came barreling through the Caribbean and rocked Florida as well. As if these weren't enough, forest fires have been scorching through California and other parts of the West. Earlier this year, it was Northern California feeling the heat. 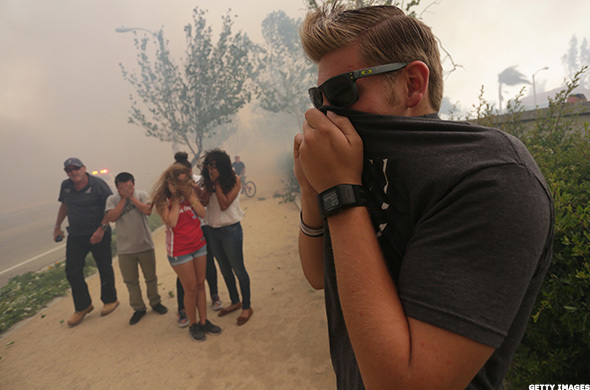 Now, flames burn through Southern California in Ventura County and just outside of Los Angeles. A few more have popped up in San Diego. It's forced many to evacuate; even Snap (SNAP - Get Report) is shutting operations at its Cali headquarters for a few days. There are questions as to what it will do to housing, transportation and the area's crop. It's also raised the question of how it will impact insurance companies. According to California Insurance Commissioner Dave Jones, year-to-date losses have now topped $10 billion. That figure is sure to grow given that the current blazes continue to burn. But many of these eventual claims will fall into 2018. Still, it was a tough year even before this event. Back in September, we reported that insurers could faces losses of up to $100 billion from Hurricanes Irma and Harvey alone. Geico -- which is owned by Warren Buffett's Berkshire Hathaway (BRK.A - Get Report) (BRK.B - Get Report) -- recently took a $3 billion hit related to natural disasters. Everest RE Group (RE - Get Report) , XL Group Ltd. (XL , RenaissanceRe (RNR - Get Report) and Validus (VR are some of the most-exposed insurers in the hurricane regions. And while companies like Travelers (TRV - Get Report) and Chubb (CB - Get Report) (mostly) escaped that catastrophe, they are among some of California's largest insurers. As are Allstate (ALL - Get Report) , State Farm and Farmers Insurance. All three public companies -- Chubb, Travelers and Allstate -- have been under pressure this month as a result of these forest fires. Although, it's hard to say what the financial ramifications will be. Goldman Sachs analysts recently initiated coverage on the three, hitting Travelers with a sell rating, Allstate with a neutral and Chubb with a buy.